SPA is a technology-rich environment in all three divisions. Our approach to technology learning is contextual and rooted in the curriculum at every grade level. Rather than focusing on learning how to use a device for its own sake, computers and other technology are used in classrooms as part of and in support of specific curricular units and initiatives. Read more about technology learning in each of the three divisions, below. 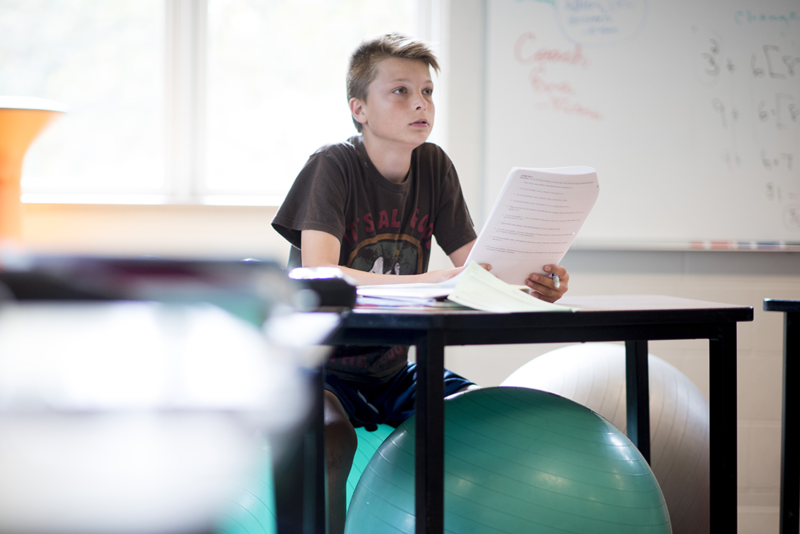 SPA takes a holistic approach to technology in the Lower School. Rather than offering instruction in how to use computers or devices--skills many children have already mastered by Kindergarten--we have developed a broad curricular initiative focued on technology, creativity, and innovation. The initiative involves three strands of skill development: computers and other devices as learning tools; computer science and engineering skills; and Maker education. Together, these three strands give students the opportunity to explore new ways of thinking that can also be applied to the academic subjects they study in their homerooms and with the specialists. Technology as a learning tool: Beginning in Kindergarten, computers and other devices are integrated into the homeroom and specialist curricula as tools for learning. The technology used is developmentally appropriate, from iPads in Kindergarten to laptop computers in Grade 5. There is no "computer lab" at the Lower School; homerooms have their own sets of age-appropriate devices, and a mobile computer lab cart is used throughout the school. Computers in the classroom are never a lesson unto themselves; they are always used in support of larger curricular learning goals. Kindergartners may use iPad apps and online interactives to practice reading, spelling, or math skills; older students will use devices to create projects such as presentations, videos, and ebooks. A 1:1 program with iPads begins in Grade 3, and through Grade 5, students use iPads as needed throughout the school day for research, writing, and other academic tasks. 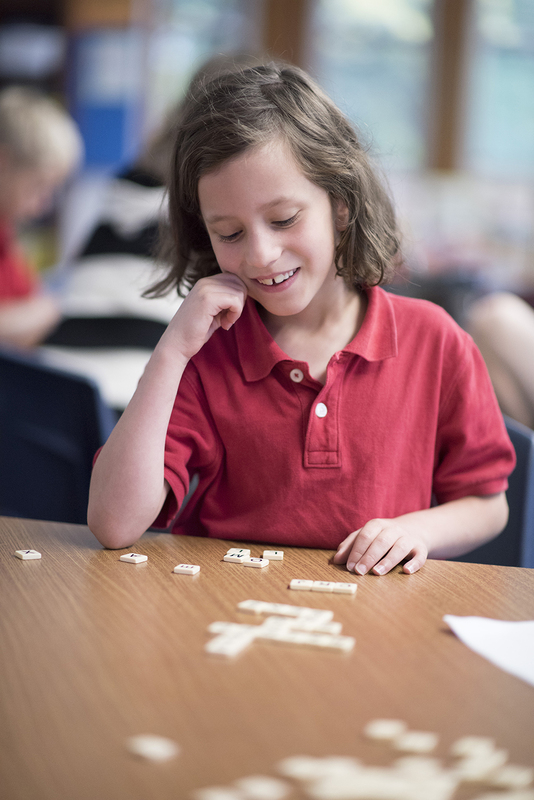 Computer Science and Engineering: The Lower School academic program incorporates computer science and engineering skills and projects as part of the science curriculum at every grade level. Students in Kindergarten and Grades 1/2 are introduced to the fundamentals of computer science and programming by using applications such as Kodable and Hopscotch; in the older grades, students begin to program with Scratch and explore robotics concepts and projects to better understand programming applications and control. Engineering challenges are integrated into the science curriculum and often take place in the Lower School's Makerspace--a laboratory dedicated to inventing and creativity. Maker education is a wonderful way to help children understand abstract concepts by creating new inventions, building models, and studying concrete objects by taking them apart and putting them back together. The Lower School's Makerspace laboratory is dedicated to these projects: time in the Makerspace is built into the K-5 science curriculum, but Maker education applies to many different areas of knowledge, including math, the arts, engineering, and communication. Maker education is also hands-on learning at its best: students learn to work together as they hypothesize, build, test, identify improvements, and start all over again. Middle School students are ready for more independence in their technological lives, but they also need supervision and support. Technology learning in Middle School is thus focused on developing students' academic technology skills while teaching them about online privacy, safety, and digital citizenship. The Middle School has a 1:1 laptop program through which every student is issued a school-owned laptop computer for classroom work and study at home. The program is phased in gradually in Grade 6, when students are assigned individual laptops for use at school only. When the Grade 6 teaching team feels students are sufficiently prepared for 1:1 use beyond the school day, students begin using the computers at home. In Grades 6 and 7, students participate in technology skill training and "wellnology" discussions, both in the context of technology classes and in advisories. Remaining skills, such as use of technology for collaboration, communication, and creative expression are integrated throughout the content areas. Students also take trimester-long computer sciences courses in grades 6 and 7 where they learn about block-based and syntax-based programming, and robotics engineering. Middle Schoolers spend a significant amount of time working with teachers and advisors developing healthy habits where technology is concerned. In Grade 6, students are introduced to our Acceptable Use Policy and begin discussions of personal privacy in terms of technology and the Internet. In Grade 7, these discussions are deepened as students explore the concept of “wellnology” or personal technology wellness. Strategies encouraging Internet safety and responsible behavior, both personally and academically, are taught. This is reinforced in Grade 8 as students transition from using school-owned technology in the Middle School to more independent use of personal technology in the Upper School. By the time they reach the Upper School, students are knowledgeable users and consumers of technology and online content. All Upper School students use a school-issued laptop computer for their coursework, which are used across the curriculum as tools for research, organization, production, and collaboration between students and their teachers. Students abide by the Upper School's Acceptable Use Policy, which provides a clear framework for the use of devices and online behavior. All courses in every discipline use technology to some degree as tools to access information and to organize and present that information in a variety of media. The Randolph Campus library serves as an information portal, providing digital access to a wide variety of online journals, databases, and discipline-specific tools for students to use in their individual research. 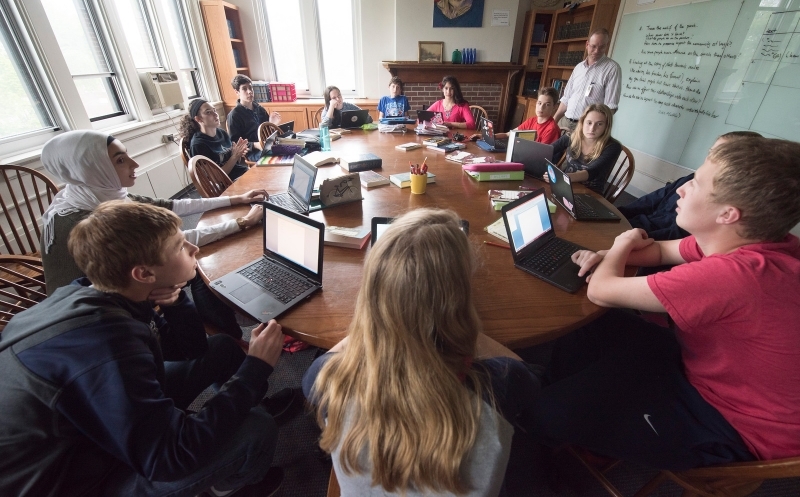 Technology is also used as an important collaborative tool in the Upper School: students use their laptops and specific online spaces for for sharing information and for evaluating the work of others.